Have you ever tried crocheting with ladder yarn? We recently started carrying City Life yarn by Premier® and I fell in love with the colors and simple sparkle. So far I have created two new patterns with this yarn and you can get them both for free! Continue reading this blog post for more information on the free City Life Scarf pattern. I used Orchid Mystery – what do you think? Ready to get started? You can find the free pattern here. Wasn’t that fun, and easy as well? We’d love to see how your City Life Scarf turned out! 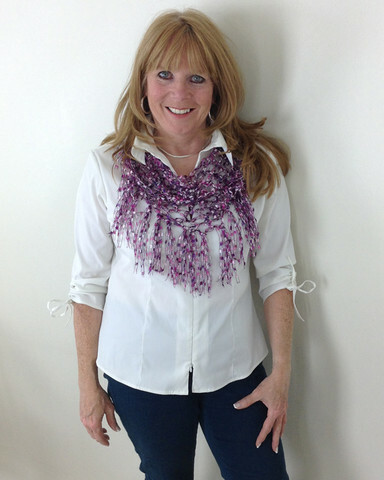 You can e-mail us at customerservice@maggiescrochet.com‏, be sure to include a photograph of you wearing your scarf, and we’ll share the photos in a future blog post.